The column was rather disappointing. 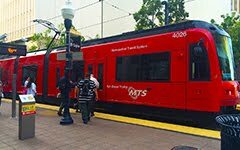 As a student in Sacramento, I took public transportation the entire length of my study and loved it. When I moved to Oahu for graduate school, I continued to enjoy public transit. When I lived in Los Angeles, I took the bus to my place of employment. Runner’s idea that riders face “long delays and wait times” appears to be an argument in favor of greater funding for public transportation. Barbed remarks that riding the bus is “unclean and unsafe” are nothing more than thinly veiled fear-mongering. Suggesting that Uber is an “affordable” alternative is an insult to my disabled mother and aunt, who rely on the accessibility of the bus system with its convenient wheelchair lifts. A company like Uber is also not a suitable choice for anyone who values properly vetted drivers. Gold Coast Transit employees are drug-tested and undergo vigorous background checks, which feels particularly important in light of the recent Kalamazoo killings by an Uber driver. Public transportation is a vital part of any thriving community. Advocating for larger highways can be considered detrimental to our county, known for its open space and access to nature. Creating opportunities for clean-energy transit would be a much wiser investment of our transportation dollars.